Their are plenty of shapes and patterns we come across in almost anything and everything.This Sunday Surprise I thought of “GOING BACK TO BASICS AND EDGY” and by edgy….I really mean edgy!! Well, I took up a Salvatore Ferragamo’s collection look and transformed the blazer into an EDGY TRIANGLE TREAT! This is a trial by me, a sober gold triangle earring, which will cover your ear fully, the top edge will have a hook which will go behind your ear to give support, and the 2nd support will come on the earlobe for normal screw attachment. 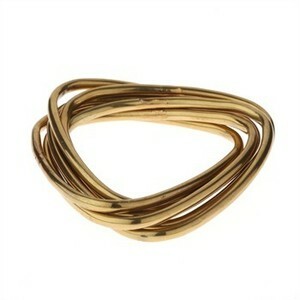 These interlocking bangles are EDGY and CHIC! Since there is too much color going on the look, minimal gold accessory is the perfect way of gearing up with an accessory.